Jonah Williams and the Turner Swamp Primitive Baptist Association. | Scuffalong: Genealogy. Jonah Williams and the Turner Swamp Primitive Baptist Association. – Scuffalong: Genealogy. Jonah Williams and the Turner Swamp Primitive Baptist Association. 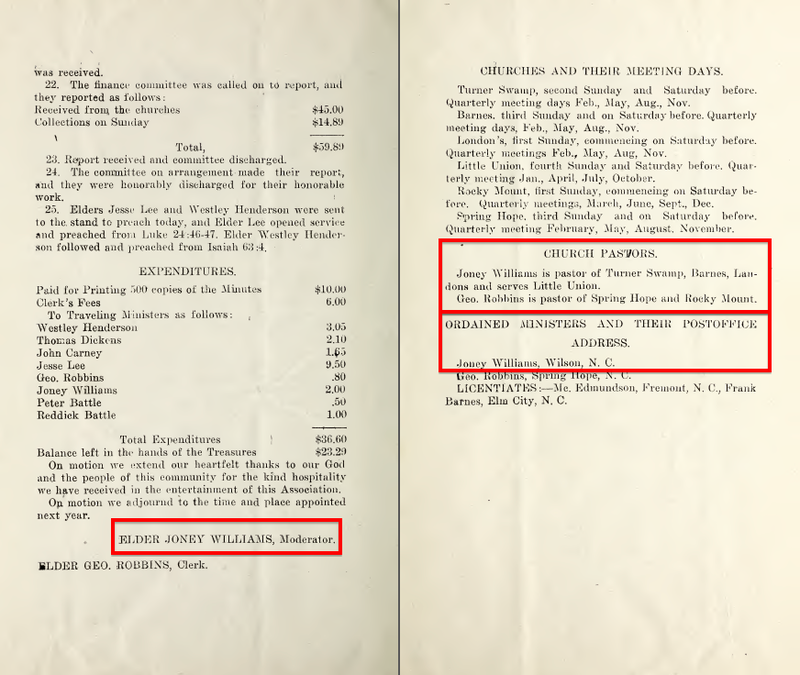 I’ve blogged often about Jonah Williams, prominent farmer, respected preacher, and brother of my great-great-great-grandfather Adam T. Artis. 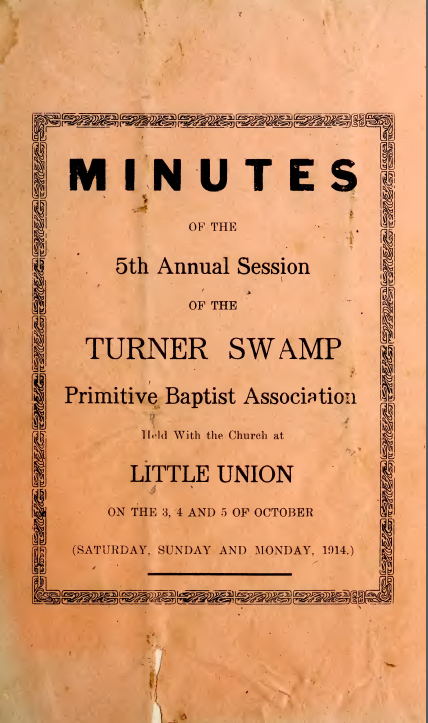 I was pleased, then, to find copies of the minutes of the early annual sessions of the Turner Swamp Primitive Baptist Association, which oversaw several churches that Jonah helped establish and/or lead. 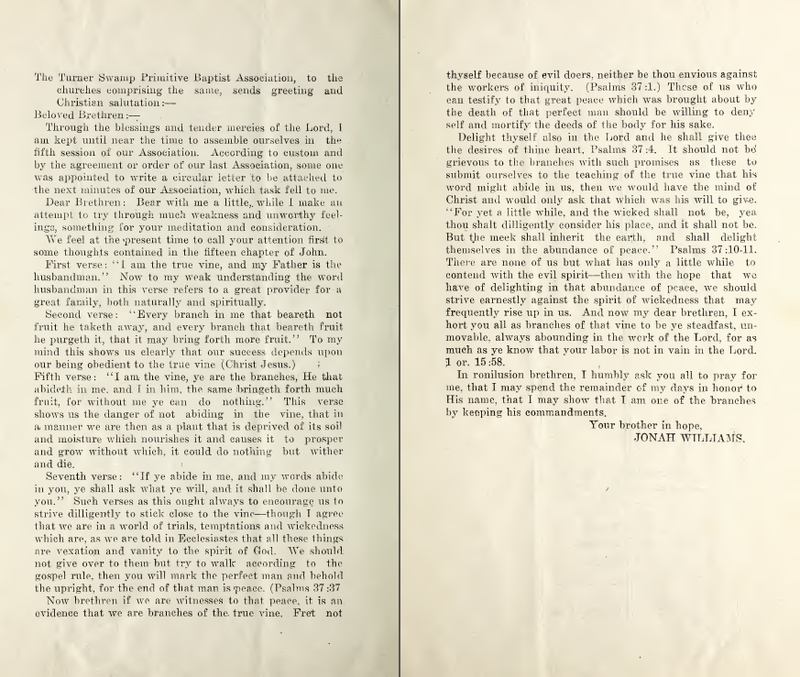 Jonah participated in five sessions before his death in 1915, and the minutes of two survive. I’ve extracted pages from those documents here. London’s Church was just north of the town of Wilson (in what would now be inside city limits.) The church is most closely associated with London Woodard, an enslaved man who was purchased by his free-born wife, Penny Lassiter. Just after the Civil War, London founded an African-American Baptist church, which seems to have been the precursor to the London’s Church organized under the Primitive Baptist umbrella in 1897. 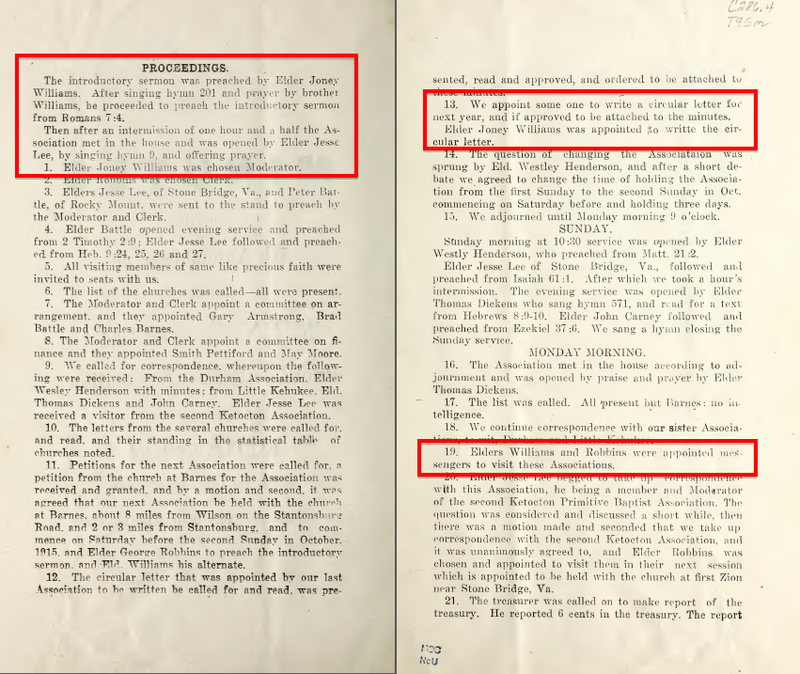 As shown below, Jonah was involved in the establishment of nearly every church in the Turner Swamp Association, including Turner Swamp (1897), Barnes (1898), Little Union (1899), and Rocky Mount (1908). Turner Swamp still meets at or near its original location just north of Eureka in Wayne County. Barnes is likely Barnes’ Chapel Church, now located at 1004 Railroad Street in Wilson. 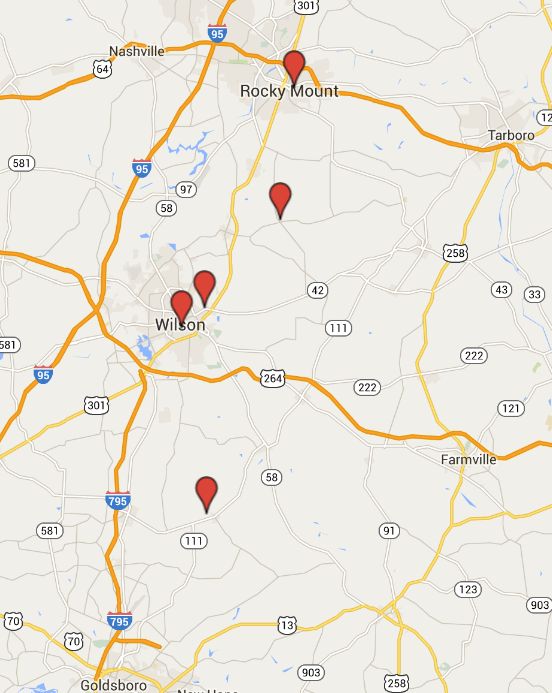 [CORRECTION: Barnes Chapel was close to Stantonsburg, in southwest Wilson County.] I had never heard of Little Union church, but a Google search turned up a list of churches within 15 miles of “Bel-Air Forest (subdivision), North Carolina,” Little Union among them. (Which is a little spooky because that’s the neighborhood in which I grew up and I didn’t input that reference point.) Unfortunately, the site’s map is blank. 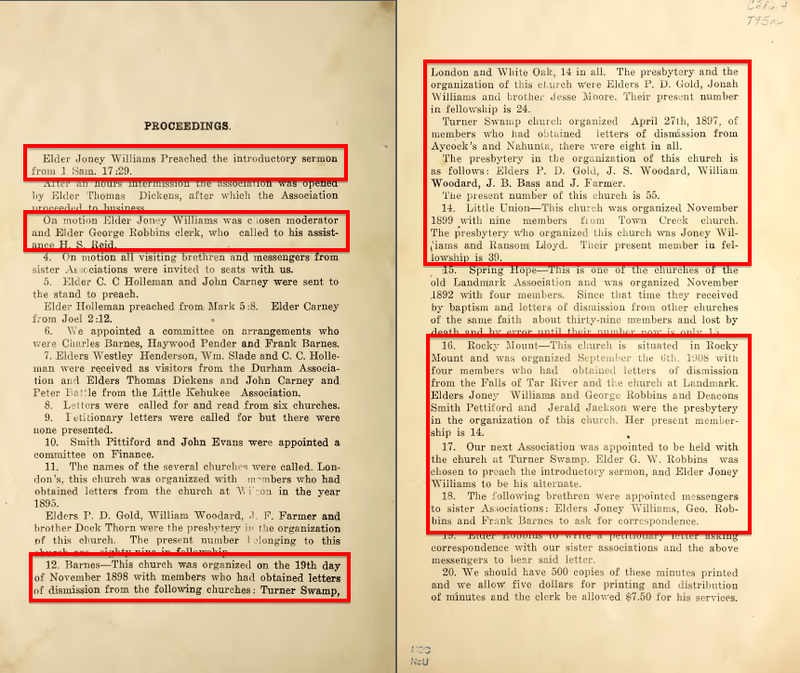 However, another search disclosed a recent obituary that referred to the decedent’s efforts to rebuild Little Union Primitive Baptist Church in Town Creek, North Carolina. 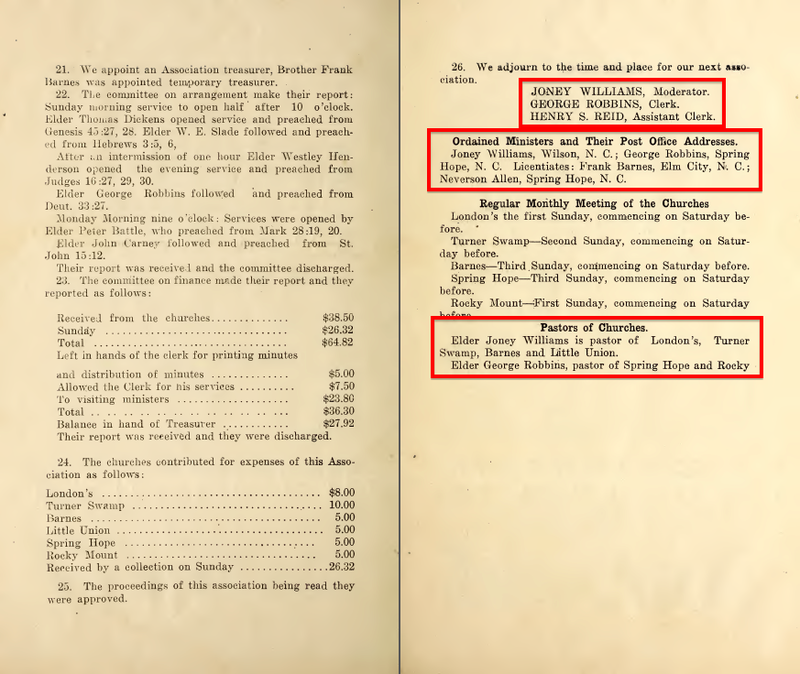 I have not been able to find current references to Rocky Mount Primitive Baptist Church. Jonah moved from the Eureka area about 10 miles north to Wilson in the late 1890s. 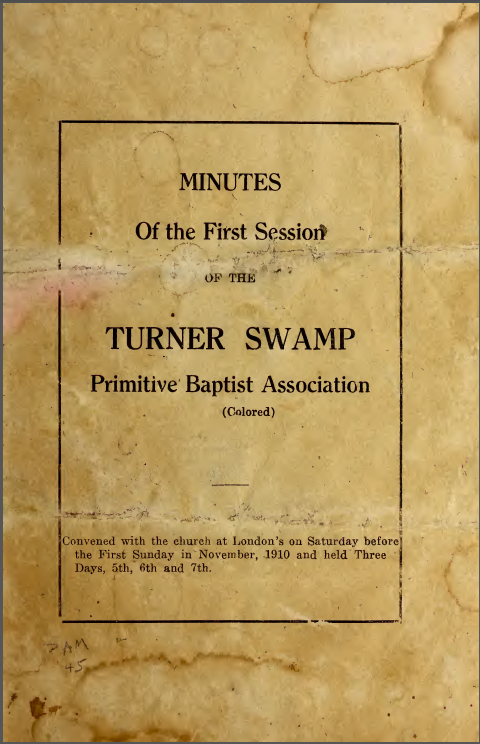 Though I knew of his association with Turner Swamp, I was not aware until finding this document that he had also been pastor at London, much less two other churches. Romans 7:4 — Wherefore, my brethren, ye also are become dead to the law by the body of Christ; that ye should be married to another, even to him who is raised from the dead, that we should bring forth fruit unto God. The approximate locations of the churches in Turner Swamp Primitive Baptist Association. Top to bottom: Rocky Mount, Little Union, London’s, Barnes’ and Turner Swamp. As the crow flies, the distance from Rocky Mount to Eureka, where Turner Swamp is located, is about 30 miles. This news brief probably made reference to baptisms Jonah conducted at London Church, which stood a few miles from the south bank of Contentnea Creek. Wilson Daily Times, 6 June 1911. → It felt like a weight fell off of her. ← Ida Colvert Stockton … Stockton. Pingback: He was rejoicing at the opportunity. | Scuffalong: Genealogy. Pingback: Small world. | Scuffalong: Genealogy. Pingback: Artis brothers. | Scuffalong: Genealogy.